When we first moved into our house a couple of years ago we had a full sized bed that didn't fit in the house. I had built the frame a few years ago and really liked the rustic design. Not wanting to get rid of it, I asked the dear hubs to carry it out back to see if it would fit between two particular trees. He's such a sport, he did and it did and it hasn't moved since. We double bagged the mattress in heavy duty plastic mattress protectors from the moving store and carefully duct taped them really tightly so no water or bugs could permeate the mattress. I also picked up some outdoor fabric and created a fitted sheet to cover the mattress, a few pillows using pillow forms I already had and created one of my favorite spots to relax on a summer day. Over time, the oasis has evolved. I realized pretty quickly that the trees dropped lots of stuff on the bed so I created a cover to protect it from that as well as rain. That cover failed so a few months ago I got a smallish tarp to put over the bed. It isn't the best looking thing when not in use but I did get a brown tarp to try to make it blend. 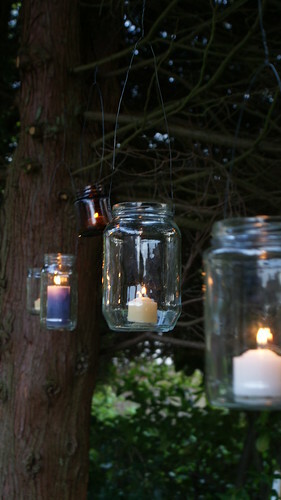 This brings me to today when I decided to make a few jar lanterns and I'm going to include a little tutorial here. They were super easy and I used things we had on hand. 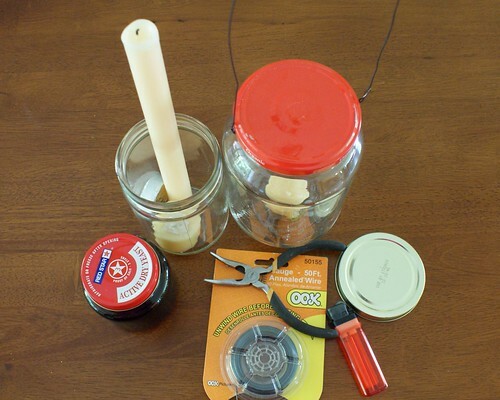 Start with a few jars, candles, wire (I used 19 guage) and wire cutters/pliars. 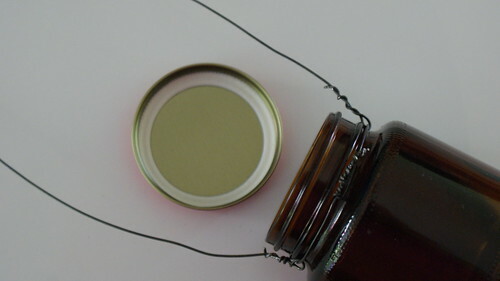 With the lid on the jar, wrap a wire around the neck of the jar below the lid and loosely twist it in place. Now take another piece around 20 inches long (or however long you want the handle of your jar) and attach either end to the first wire. Tighten the first wire to hold the handle wire in place. If you want your candles to stick in the jars, you'll need to stick them down with some hot wax or that special stuff they sell to affix candles in place. Remember, if these are going to hang above someone, you don't want the bottoms to look ugly though so be mindful of how you attach them. 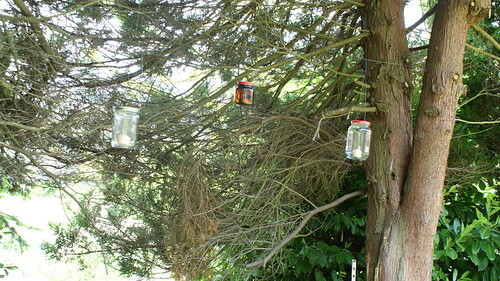 I took three jars outside and hung them from a wire that I stretched between the two trees on either side of the bed. Then I grabbed my favorite model and took some pictures of the whole setup. A few hours later, after I put him to bed, I raided the fridge for jars of expired food (and ate a few pickles) so I could add a couple of jars to the line. If we have a party, I'm sure I'll decorate the jars a little with some ribbon or twine or something. The possibilities are really endless. If you need me I'll be out back with a book. I saw these at Pottery Barn today and thought, "I could make those!" Thanks for the instructions!! You're welcome. It was super easy. I started out trying to use one piece of wire for the neck and the handle but quickly realized it was much easier just to do the neck wire then attach the handle to that. Now I'm thinking about adding some twine or something decorative to each jar but I've got some other more pressing projects to tackle first. This is so whimsical and romantic! Please stop by www.laughloveandcraft.com and link up to my Share the Wealth Wednesday Link Party! I'm your newest follower! Thanks for coming by Laura. I'll link up for sure, I appreciate you letting me know about your link party!! Cute Idea! wish I had an outdoor space! 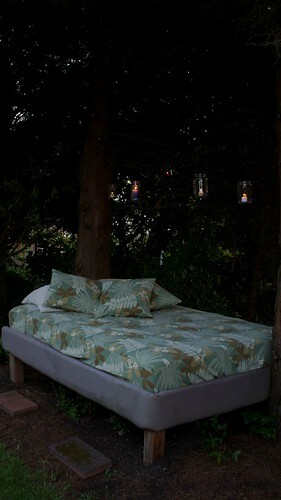 I absolutely love your outdoor bed. it looks so terrific and cozy. i would want to be relaxing on that all the time. I love it. And the cadles set it off beautifully. Thank you Eileen. 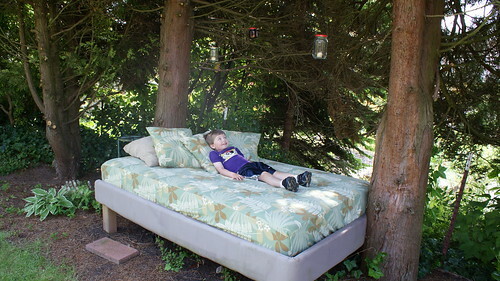 I love it too, some of my favorite backyard memories have been built in that bed. On sunny days, my little guy likes to climb up there then asks if we can listen to a song he loves (Under A Shady Tree by Laurie Berkner) and he even tolerates me singing along. We lie on our backs and look for birds and squirrels in the branches. Oh I just love this idea! It's so whimsical!! Another idea is to add some old recycled crystals from a Chandelier. It makes some wonderful sparkles. you wire them around the neck and they hang on the outside of the car. Oooh, I like it!! I've been thinking about going back to embellish these but have been taking care of a sick kiddo for the past few days so haven't had much time to be playing in the craft room. I actually have some perfect fake crystals from an old Ikea chandelier that would probably look pretty great (and then I can justify having kept them too). 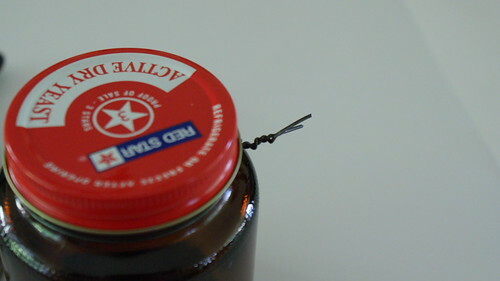 Do you have a secret on how to get sticky labels off of glass jars? A few of mine have sticky labels. I soaked them in hot water and it got the paper part off, but still left sticky residue. As you can imagine... it kinda ruins the look. Lol. Help? I'm a HUGE fan of Goo Gone (not to be confused with Goof Off). Goo Gone is a citrus oil based cleaner that gets stickers off anything as well as lots of other uses and it won't stink up your kitchen or your hands. Until you can get your hands on some of that, I've also had some luck with super hot water, a scrub brush, Dawn dish detergent and a lot of elbow grease. The hot water seems to melt the sticky enough that then the Dawn can break it down better. I haven't had luck with other dish detergents, somehow Dawn does it better. Good luck!! try spraying the labels with cooking spray (let it sit for a while, this breaks down the glue) or soaking them in distilled white vinegar (does the same thing but stinky). At first I thought, they don't match, and I wasn't sure I liked the way it looked. The more I checked it out the more I thought how cool it would be outside on our lanai by the pool and in the garden. Even on the brick short wall around the pool. I am definately going to try this and check out more of your stuff!! Thank you so much!!! De Solv It works btter than goo gone. Try your local Ace/True Value/Do it Best hardware store. I you can't find it try rubbing alcohol. De slov it works great on laundry stains too a litle goes along way. One bottle lasts me a year and we use it ALOT. Thank you! You could certainly do this craft with a box of mason jars to make them all match. I wasn't sure I'd like the mismatched look either but I was really on the hunt for a free project and I really like the look now. I actually got excited last night when I finished up a jar of something. I'm a lantern junkie now. I love this idea. I am in the process of building a patio so this will be something that I will add when I am finished. Oh, I love the bird seed idea! I might have to do that. I was trying to think of ideas to embellish these while still maintaining the natural look I think coordinates best with the location (and our lifestyle). I have not tried it, but I hear WD-40 takes labels off well. I am going to try it on a wine bottle project. I would LOVE to share a pic on my blog with a link back to your page for directions under the craft/recipe section! Just wanted to make sure this is okay, but these are just too cute! Let me know! If you have a blog button, let me know! I'm putting each blogger's button below their feature. This is super cute. I am moving to a house next month. We have been remodeling the inside and not doing much to the outside right now. I think this will be a great to beautify the outside. I have just started a blog. I am just adding things that I like. I would like to add this if I can figure out how to. The moths can get into bags inside of sealed boxes, Tupperware, ziplock bags, anything other than the snaplock containers or screw top jars. If you buy those huge plastic jars of pretzels or candy, those work great for food storage ! Recycle them! Hi! I love your "garden bed" and no weeds!! Although, I have a sneaky feeling your model may grow like one!! I saw the suggestion for using bird seed to hold the candles in place. While, that may be a good idea for a wedding...if you are going to keep the candle lanterns outside for a longer period of time--it may attract birds and squirrels (tipping the lanterns over) as they attempt to eat the seed...spreading the seed all over your bed! The naturalist version of eating crackers in bed?! I would suggest using sand or pebbles or sea shells. I think all those items would be non flammable...and most critters wouldn't be interested in them. Of course, you do run in the occasional bird/squirrel with a rock collection, but what are you gonna do? Thank you for your kind words and your thoughtful suggestions. I still haven't gotten around to adding anything to the jars as the weather has been so sporadically nice here in the northwest that I've been prioritizing other projects ahead of this one. Maybe I'll let the little guy collect treasures as we're out and about and let him put those treasures into the jars. Something will come to me but I like your suggestions so I'll add them to my mental list of options. Would you believe that when we put this bed out there, it was TOTALLY private from the neighbor we back up to (just beyond the fence). Then one day she brought in some tree people to apparently hack down most of the trees in her yard including the one that provided us great privacy from her. Thankfully she hasn't trimmed stuff back since then so our trees and a few trees she didn't have cut down are filling in a bit but we were SUPER bummed when she did that. We've been struggling to create our private space again ever since. I've thought and thought about this exact idea with the canopy. I was thinking I might use a treated painters drop cloth since that's sturdy, inexpensive and comes in big pieces. The thing that has held me back though is that the little guy likes to look up into the trees when we lie on the bed so I'd like to find a way to easily put something up for when he's not around but that we can take down when we're not using it. It's on some to-do list somewhere. Thank you for your thoughts. I'm so glad you're going to try it out. If you blog about it, I'd love to see your pictures! Feel free to add a link back to it in a comment here. perhaps you could find a side to a pop up tent that has a window on it? That way you would be sheltered from the elements but still see the sky! I know there are tons of great paints out there but have been hearing great reviews about the new Martha Stewart stuff at Michaels. I think they have some great metalics that might be pretty awesome stenciled on the jars. If you remember, I'd love it if you'd send me pictures of them when you finish. PS Congrats on your daughter's engagement.